The Billionty-Oneth Geek: Torsten Krol's CALLISTO!! From around Christmas time, I had a good momentum going in terms of reading the stack of books I’ve got lying beside my bed. I knocked out 3 titles in the span of a month, which for me, is a fast pace. 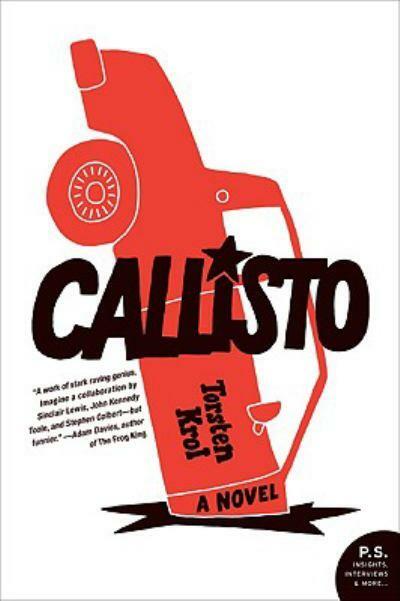 But when I started reading Torsten Krol’s Callisto, the pace grinded to a near halt. It’s not that it’s a bad story, but I just never felt that connection with the characters as I had with the last book I read (that being Slam by Nick Hornby, love, love, love). Callisto follows a big lummox of a character named Deefus Odell (an astute individual, as you can tell by that name). Deefus is from the south and isn’t the brightest crayon, but somehow he manages to get by. Without a clear direction in life, he decides that the only thing to do is to join the army and serve the country. He drives across Kansas to hopefully do just that. Unfortunately, his Chevy breaks down in the middle of this small town called Callisto and it’s here where all the fun begins. He meets a local yokel named Dean who helps him out by setting him up with his lawn mowing business. By pure accident, Deefus accidently kills Dean one night which sets off a series of events, putting him at the center of a terrorism situation, involving the news media, drug dealers, the FBI, the government and the church. If it all sounds zany, well it is. The story is a satire on the state of the US and the war on terror. I picked it up at the book store not knowing too much about it. I read the back, was intrigued and also quickly browsed some reviews online before picking it up. One of the reviews I read described the story as Forrest Gump-like, which I was sold on. However, that analogy is very loose. Deefus is Forrest Gump-like in that he’s naïve and a bit slow, but that’s where the comparisons end. Because of his southern charm, it’s hard to avoid the comparison of Deefus’ speaking skills to that of George Dubya, which provides some good comedy. The story was a bit too slow moving for me, that plus the characters that I couldn’t connect to made it a difficult read to plow through. However, the last third of the book moves well when pieces of the puzzle start coming together. Still, the ending leaves a bit more to be desired. The story is laced with dark and oftentimes, odd humour. But at the same time, it's never laugh out loud type humour. Author Torsten Krol is a bit of an enigma himself. He supposedly resides in Australia, but not very much else is known about the elusive author. Some say that it’s just a pseudonym for a more well known author and interestingly, some claim that he is Stephen King. I think a story about this mysterious Krol would be more interesting, if it is indeed Stephen King. For me, the book is a tough recommend only because the pacing didn’t work for me. If you’re up for reading a satire then I suppose it might work for you. Til next time, later geeks!